Following surgery, most patients will experience a variable amount of pain. This is dependent on what type of surgery you had and how your body reacts to surgery. You will be given a prescription for pain medication following surgery to control your pain. You should take the pain medication regularly for the first 2 days and then only when required or before physiotherapy sessions. If you feel that you are having an extraordinary amount of pain following surgery despite taking pain medication, please contact my office (numbers listed below), or after hours the on-call orthopaedic registrar at Concord Hospital on 9767 5000. 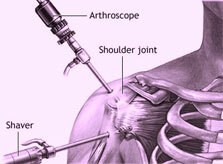 Following shoulder arthroscopy there will be a significant amount of swelling in the shoulder. This is due to the surgery itself but mostly due to the arthroscopy fluid that is used to expand the joint and help visualization. It is not uncommon for the swelling and bruising to travel down the arm into the forearm and hand and also into the chest. It is extremely important to remove all jewellery, especially rings on fingers before surgery- these should be left at home. To help with the swelling after surgery you should perform simple hand, wrist and elbow exercises 3 times a day for 20 minutes each time. If you feel you have and extraordinary amount of swelling or bruising following surgery, please contact me as listed above. Fluid is pumped into the shoulder to aid visualization during surgery. This fluid causes the shoulder to swell and it is normal for this fluid and some blood to ooze out of the wounds after the surgery. A bulky dressing may be applied over the smaller dressings. This dressing often becomes soaked with fluid and or blood. It may be removed after 24 hours. Underneath this bulky dressing are smaller “stick on” dressings. They should be changed if they are soaked through, but may otherwise be left in place. Most wounds should be dry by 5 days after surgery. If your wounds are still draining thick blood or thick yellow fluid then you should contact me or my orthopaedic registrar on the numbers listed. You should not soak the wounds in a bath or swimming pool for 2 weeks. You may shower or sponge bath after surgery, but you must not scrub the wounds and must try to keep them dry by covering them with a clean garbage bag or “Glad Wrap”. You may take the sling off when in the shower and support it with the other hand. If the wounds get wet, just pat them dry with a clean towel and apply new dressings. It is important to keep the armpit clean and dry. When cleaning the armpit, don’t move the arm with the muscles of the shoulder- you may damage the repair. Instead, lean forward by bending at the waist and allow the operated arm to gently dangle away from the body. You can then sponge and dry the armpit. You will wear the sling for 3 to 6 weeks depending on the surgery you had. You should wear the sling all the time, including sleeping, unless you are showering or doing your exercises. You can gently use your operated arm to eat. It is easiest to slip your arm out of the sling and use your hand to feed yourself by bending at the elbow. Keep your elbow at your side and do not reach or do anything away from your body or lift anything heavy (no more than a coffee cup). Similarly you can write or type by keeping the elbow at your side. Some patients have difficulty finding a comfortable position to sleep. When you sleep on your back it may help to place a small pillow behind the elbow or shoulder to help support the weight of the shoulder. If you sleep on your side (the operated side up) then it may help to place a pillow between your arms. Do not sleep on your operated side. You can also sleep in a reclining chair or propped up with pillows in bed. When you are getting in and out of a bed or chair, DO NOT use your operated arm to push down. This depends on the type of work you do, how much pain you are in, and what type of surgery you have had. In general, most patients do not work until they are seen back in the rooms or clinic at 10 to 14 days after surgery. After this, most patients are able to tolerate either single-handed work (i.e. answering the phone) or light deskwork duties only.